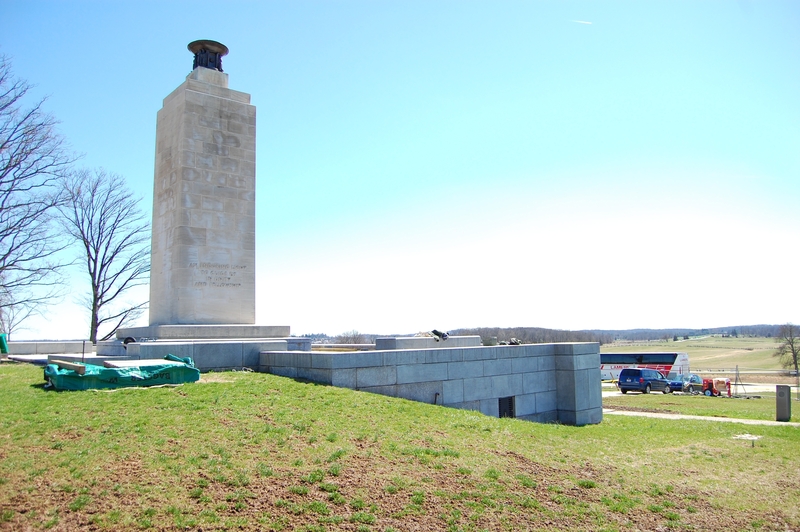 The Eternal Light Peace Memorial, or Peace Light, on Oak Hill is undergoing restoration.This view was taken facing west at approximately 1:00 PM on Wednesday, March 29, 2017. 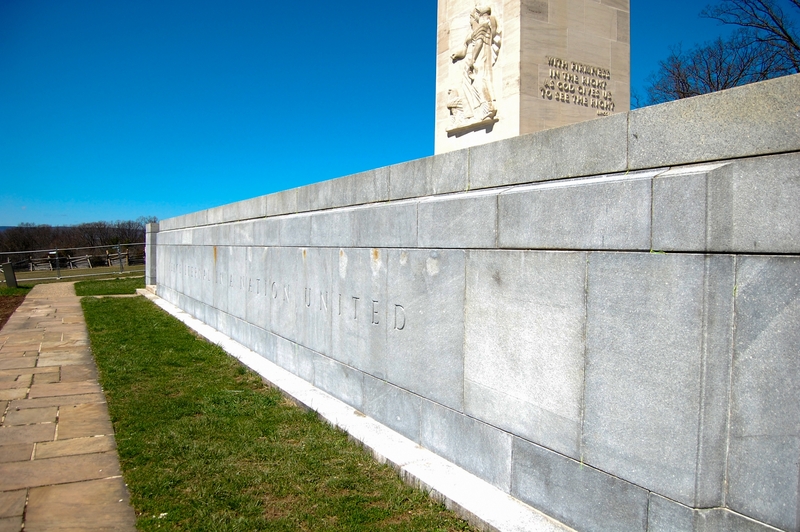 The memorial was dedicated on July 3, 1938 as part of the ceremonies for the 75th Anniversary of the Battle of Gettysburg. 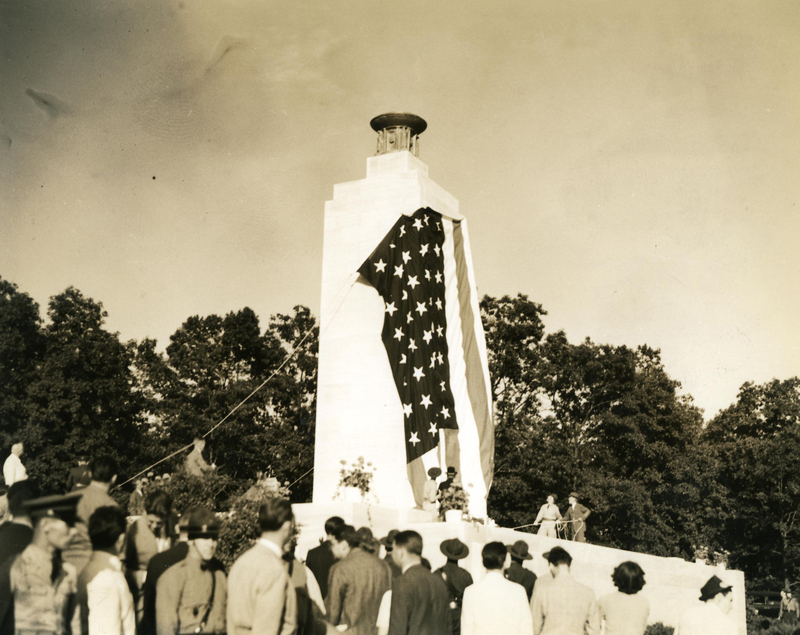 Approximately 1800 Union and Confederate veterans attended the 75th Reunion, and President Franklin D. Roosevelt dedicated the monument with a nine minute speech.This view was taken facing northeast on July 3, 1938. 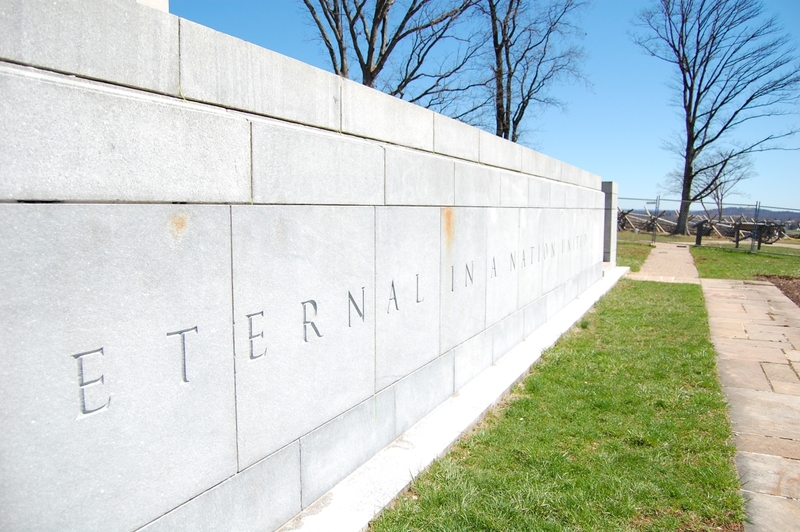 And five years after its dedication, the memorial was already in need of work. The restoration crew in this photograph is hoisting one of the monument’s granite capstones.This view was taken facing north by National Park Ranger Frederick Tilberg in August of 1943. This restoration project was started last September, but was stopped due to poor weather and the arrival of winter. 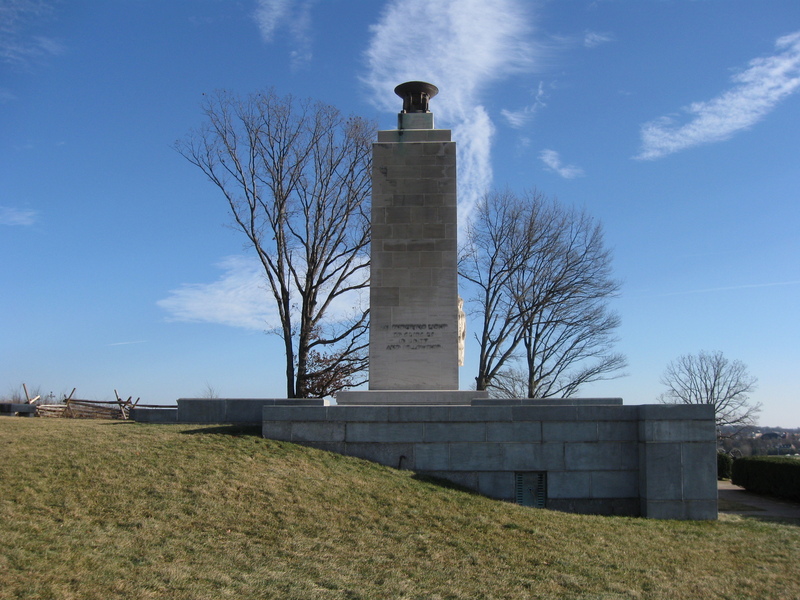 The monument’s base is made of Maine Granite. That’s the gray stone you see here. The 40 foot tall shaft is made of Alabama Rockwood Limestone (right background).This view was taken facing north at approximately 1:00 PM on Wednesday, March 29, 2017. The restoration is headed by preservation staff from the Historic Preservation Training Center out of Frederick, Maryland. 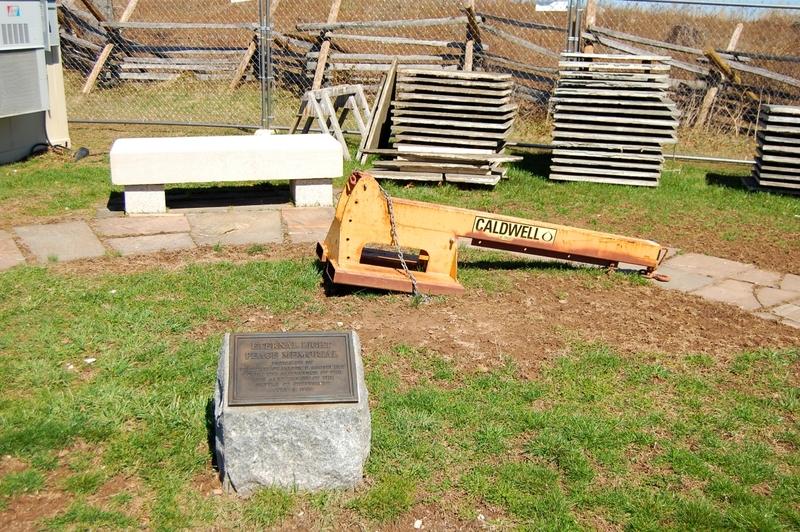 Work has resumed on the project and this week consisted of a crew of two: Brian Griffin, who last made an appearance on the Daily while chronicling his work in restoring Smith’s 4th New York Battery Monument at Devil’s Den…This view was taken facing northeast at approximately 1:00 PM on Wednesday, March 29, 2017. …and mason Gary Currens. Gary previously worked as a seasonal mason for Gettysburg National Military Park. 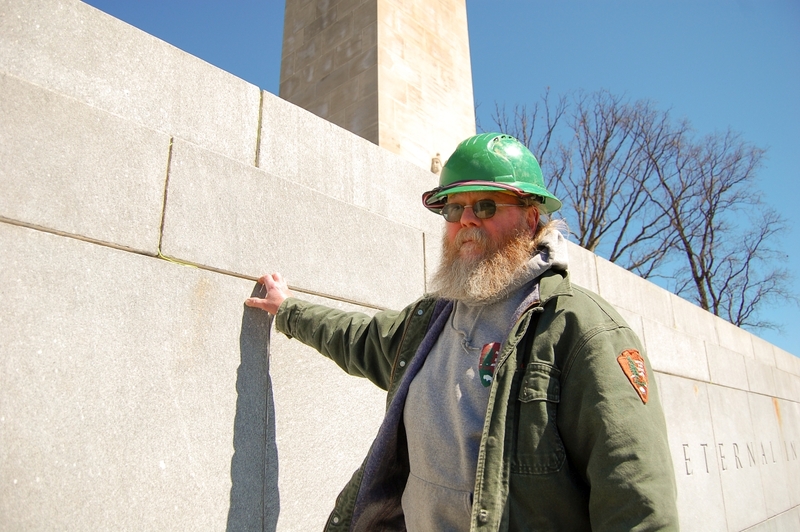 He has worked on monuments and projects at Gettysburg since the 1980s. 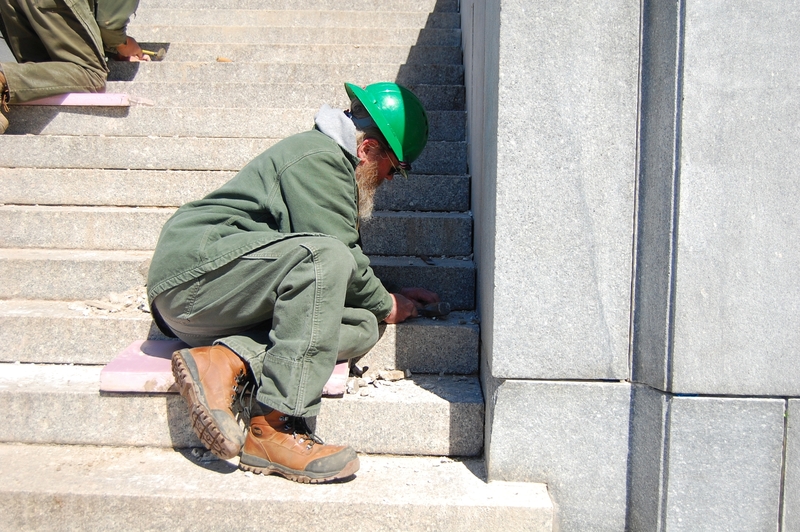 Gary and Brian were using a hammer and chisel to knock out the joints on the monument steps.This view was taken facing northeast at approximately 1:00 PM on Wednesday, March 29, 2017. 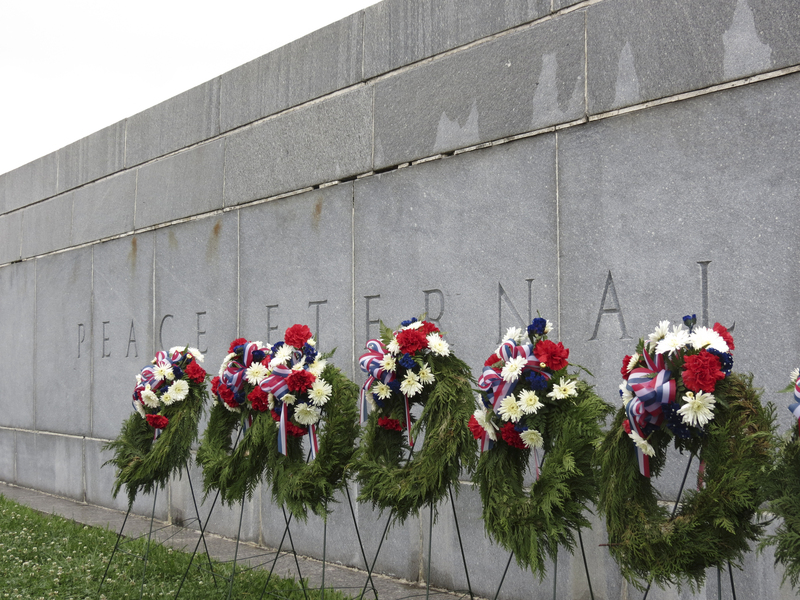 Gary’s hand is resting on the one of the granite slabs that makes up the front of the Eternal Light Peace Memorial. All of these granite slabs were removed so that they can be repointed.This view was taken facing east at approximately 1:00 PM on Wednesday, March 29, 2017. 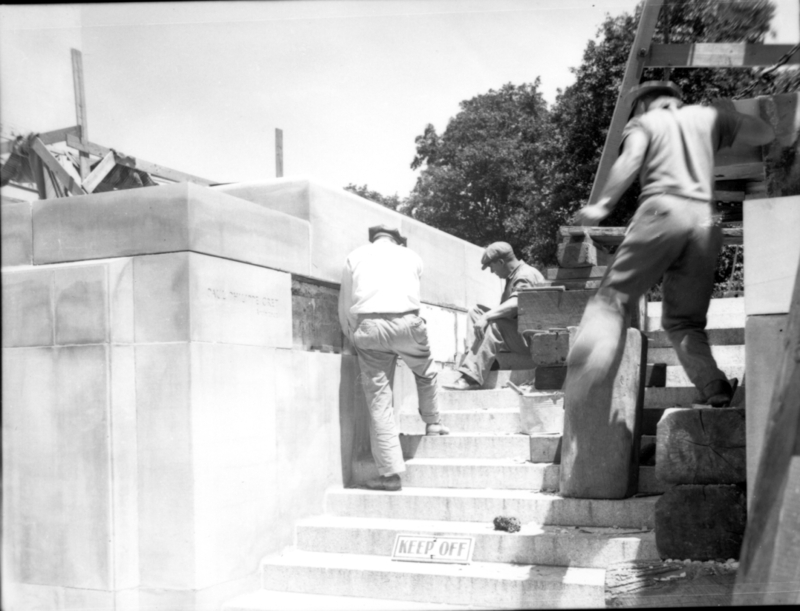 Masonry work is a necessity on a monument with as many parts to its structure as the Peace Light.This view was taken facing north by National Park Ranger Frederick Tilberg in August of 1943. The mortar in between the stones gets old and cracks or falls away. 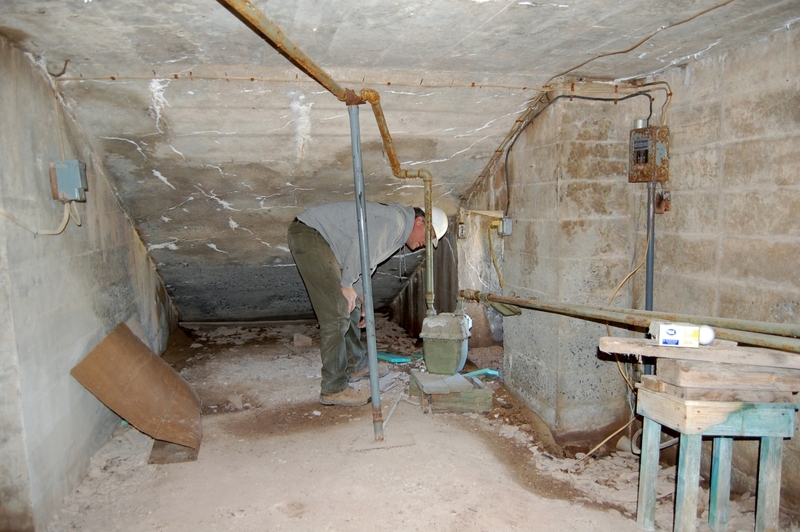 “Repointing” is the process of putting new mortar in the joints and sealing the gaps. 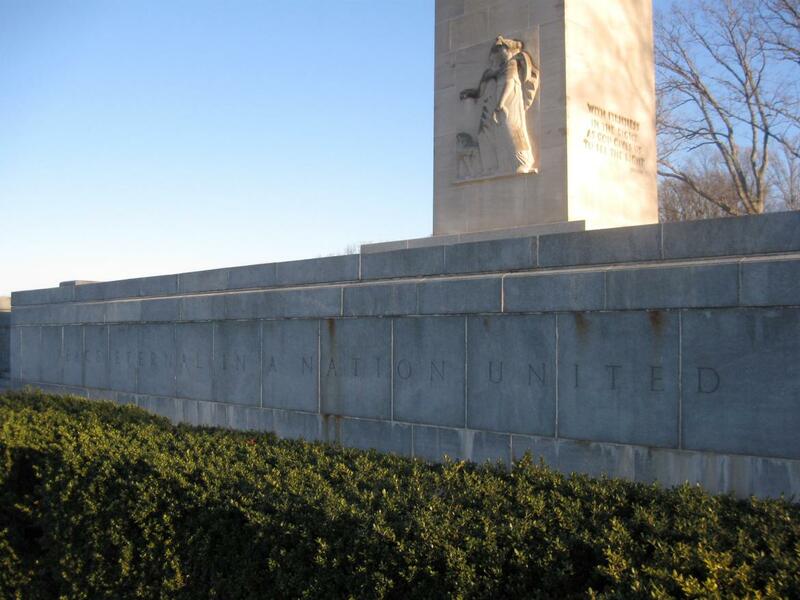 This image shows the joints on the monument’s front in 2008.This view was taken facing northeast at approximately 8:00 AM on Thursday, December 25, 2008. 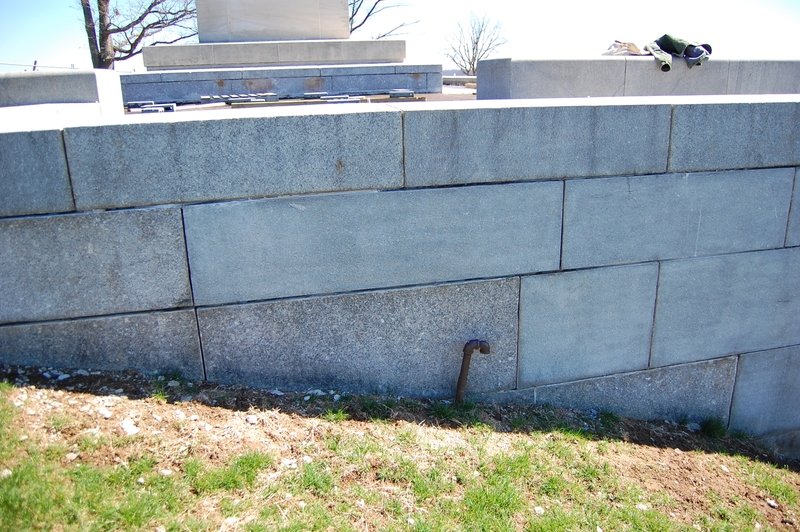 Here’s a better view of the masonry joints at the front of the memorial during the sesquicentennial.This view was taken facing north on July 1, 2013 by the National Park Service. The paving stones (sometimes just called pavers) that makeup the walkway around the monument also required attention.This view was taken facing northwest at approximately 1:00 PM on Wednesday, March 29, 2017. 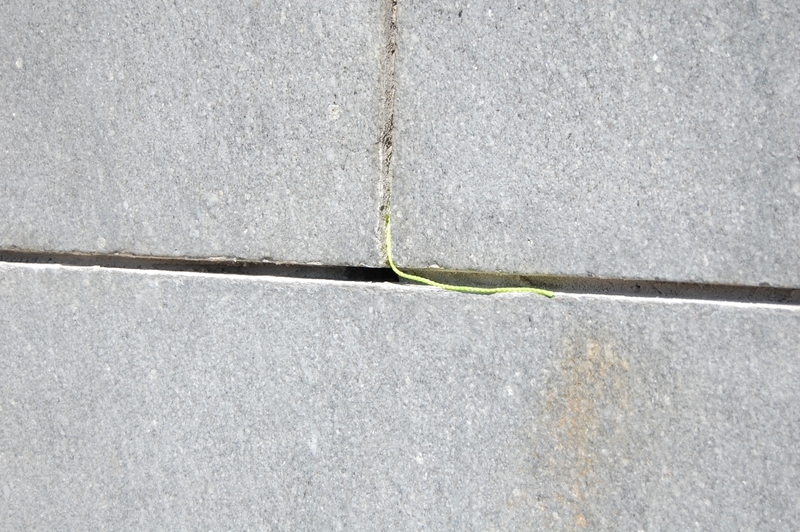 Gary told us that the paving stones are not made of granite – they’re made of blue flagstone. 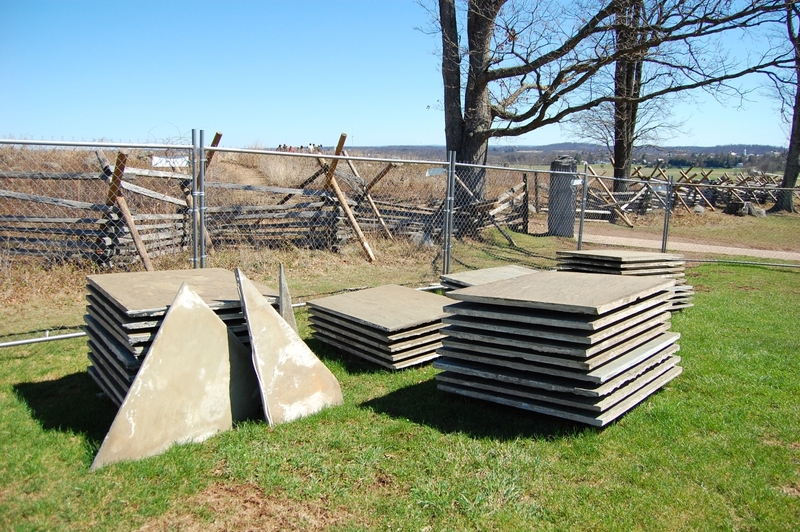 Each of these flagstone slabs weighs approximately 300 pounds. Each had to be carefully removed with the assistance of a vacuum device. We asked Gary what the hardest part of this restoration job is: “The hardest part of any of these jobs is safety.”This view was taken facing northwest at approximately 1:00 PM on Wednesday, March 29, 2017. Out of the dozens upon dozens of stones removed, only two broke during the dismantling. One of those that broke already had a crack from weathering.This view was taken facing east at approximately 1:00 PM on Wednesday, March 29, 2017. Each stone was numbered and set down in the order that it was removed from the walkway. They’re going to have to be put back in the same order. The “membrane” that the flagstones sat on also has to be redone.This view was taken facing northwest at approximately 1:00 PM on Wednesday, March 29, 2017. 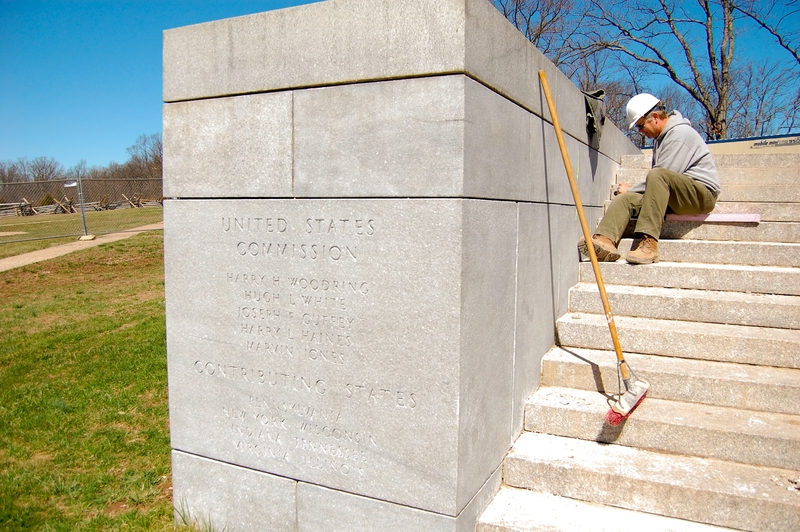 A new membrane has already been put down on the other side of the monument. Once the membrane is in place, then the flagstones can be returned.Brian Griffin is still working on the step joints. Oak Ridge is in the left background. The McPherson Barn can barely be seen in the center background. This view was taken facing south at approximately 1:00 PM on Wednesday, March 29, 2017. 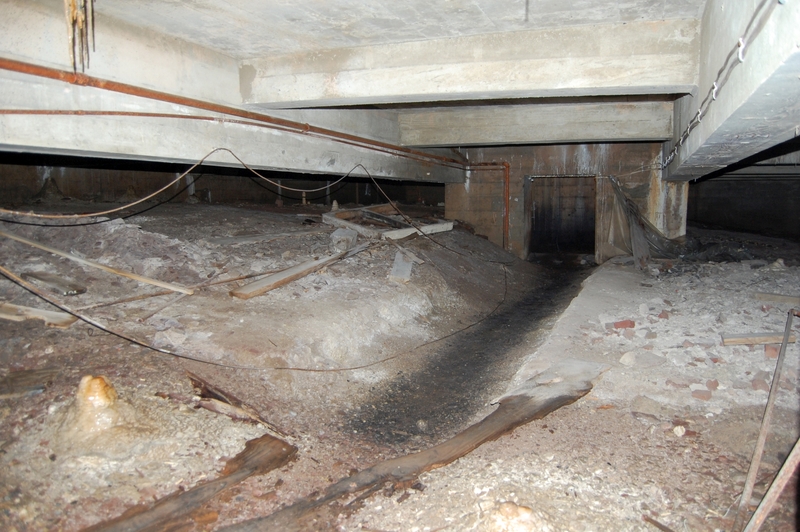 From talking to Gary and Brian, the most pressing problem with any large structure like this on the battlefield is water damage. When water gets into stone, freezes, expands, and melts again, it can do serious damage to historic stonework. Many have noticed rust spots on the monument. 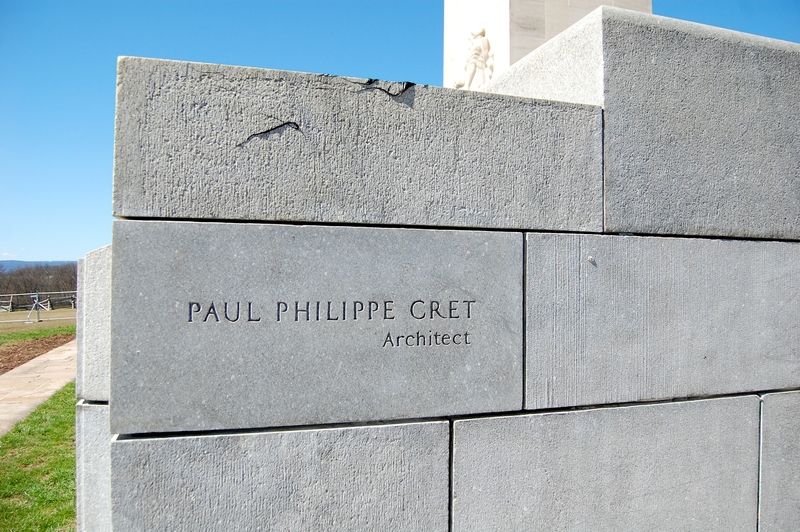 These are from pieces of steel that hold the granite stones in place on the side of the memorial. When water gets in behind them, the pieces of metal rust, and the rust comes through the joints.This view was taken facing east at approximately 1:00 PM on Wednesday, March 29, 2017. So, shouldn’t a monument like this have some sort of plan for draining water? 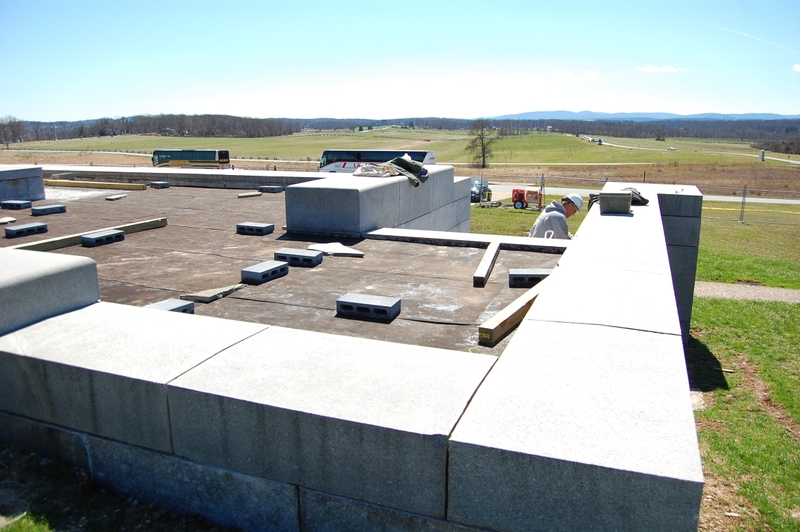 There are four drains on the structure, each at a corner of the monument.This view was taken facing southwest at approximately 1:00 PM on Wednesday, March 29, 2017. The problem, Gary and Brian told us, is that though water goes through these drains, it’s unclear where the water ultimately ends up. Is water draining at the Mummasburg Road? Beyond it? Is it draining at all? The large granite capstone that you can see by the drain weighs upwards of 1900 pounds.This view was taken facing southwest at approximately 1:00 PM on Wednesday, March 29, 2017. 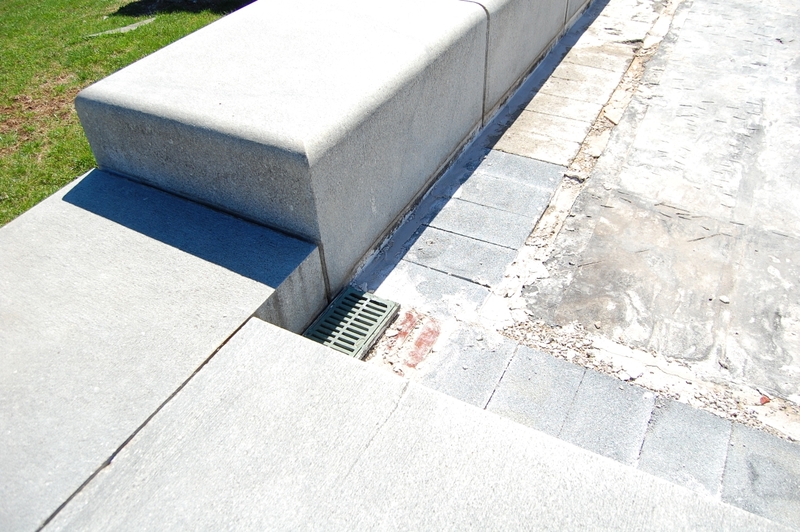 The granite stones that surround the monument’s base are currently without mortar. 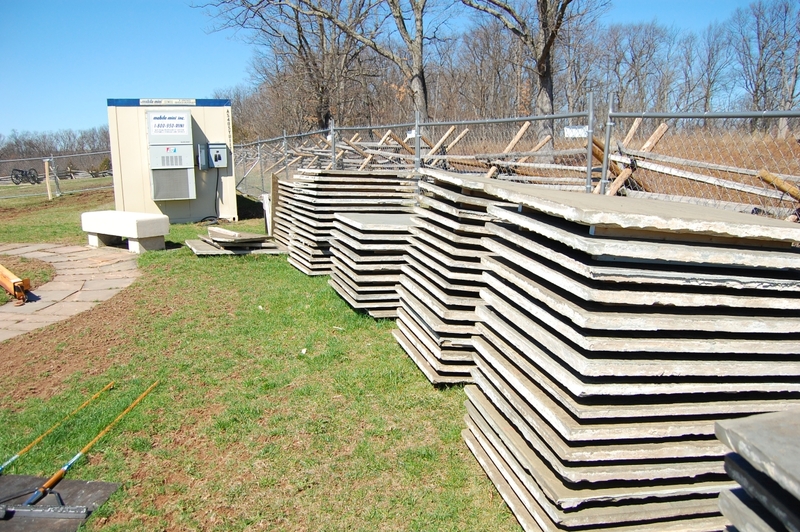 Right now, the stones are sitting on lead shims that support their weight.This view was taken facing northwest at approximately 1:00 PM on Wednesday, March 29, 2017. Preparations for repointing these stones have already been made. 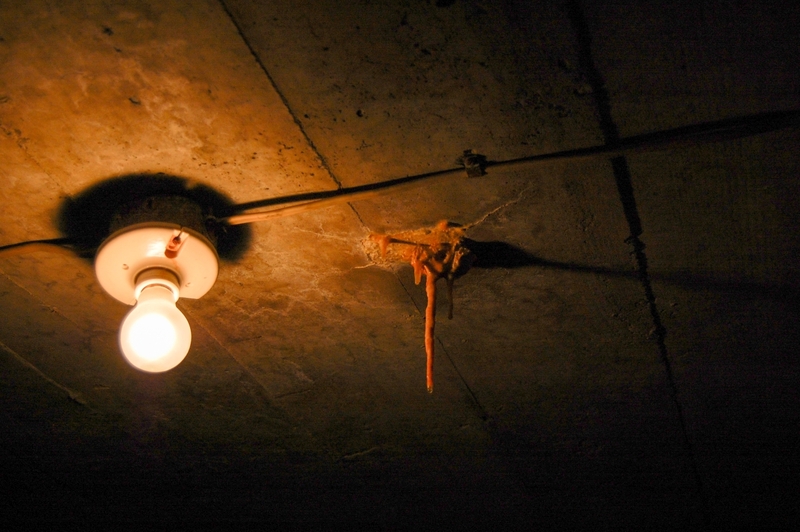 If someone messes up while pointing this joint, they can pull on this string to bring the mortar out and try again.This view was taken facing northeast at approximately 1:00 PM on Wednesday, March 29, 2017. 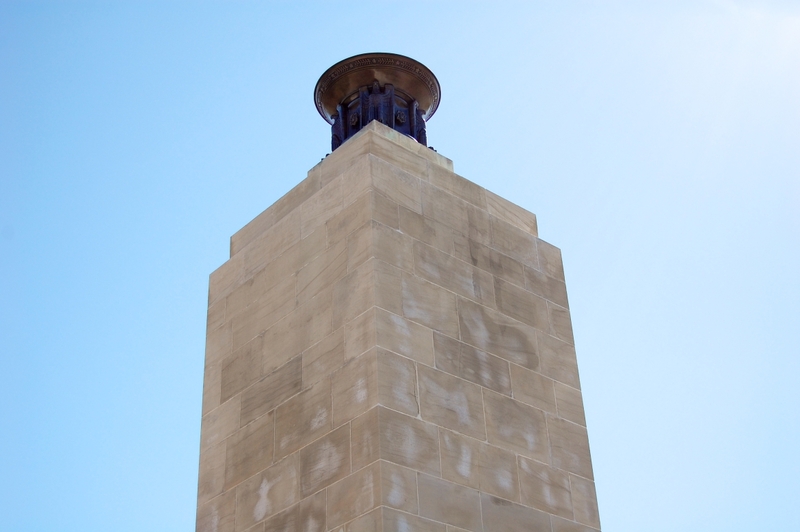 Last year, the ignition system that lights the eternal flame was replaced. 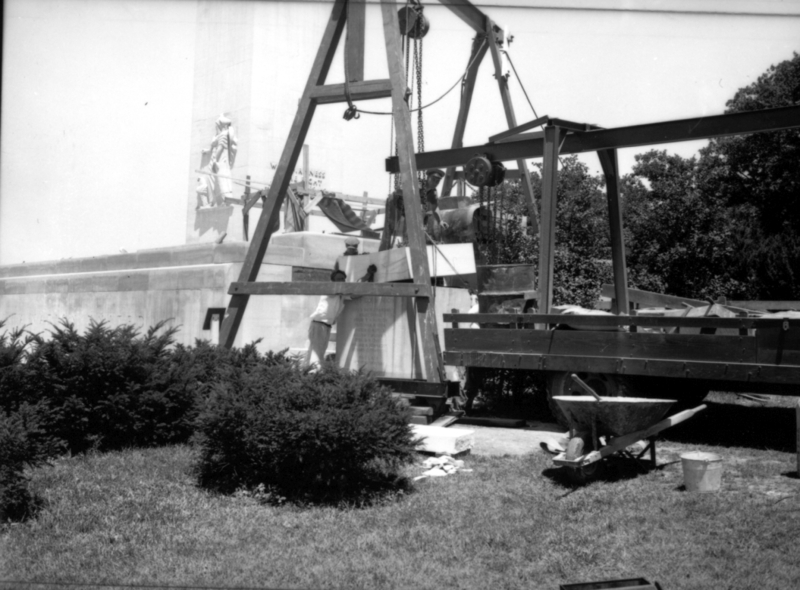 The bronze urn that holds the eternal flame was also removed and cleaned. President John F. Kennedy visited the Peace Light on March 31, 1963 with Mrs. Kennedy. She may have been inspired by the eternal flame on the Peace Light and decided that her husband’s grave at Arlington needed to have one.This view was taken facing north at approximately 1:00 PM on Wednesday, March 29, 2017. 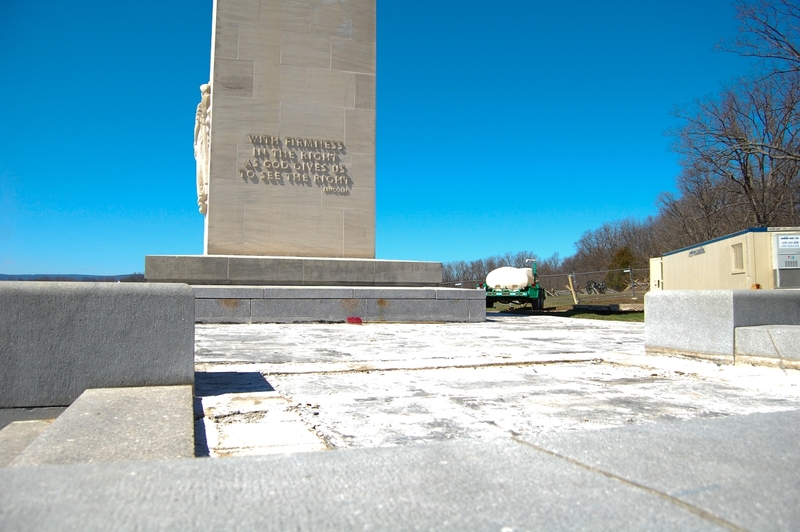 On the northwest side of the monument is a small door.This view was taken facing southeast at approximately 1:00 PM on Wednesday, March 29, 2017. Just above the door is a gas pipe. 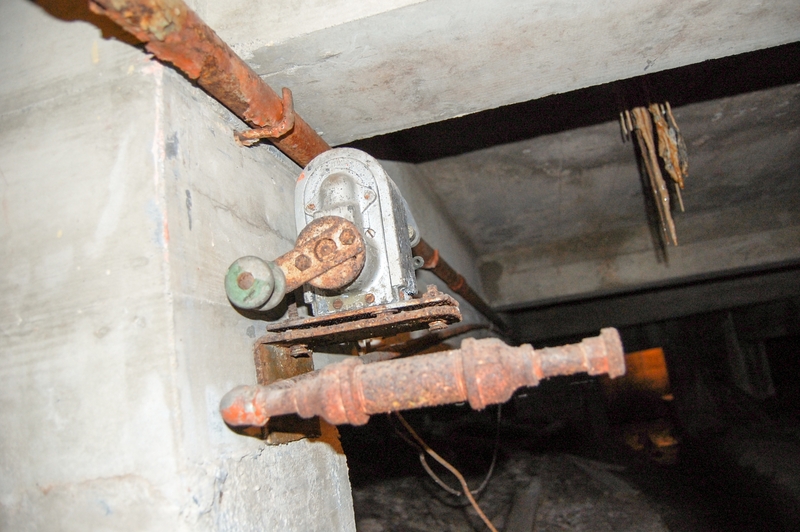 Brian told us that this is a safety mechanism for the main gas-line inside the monument. If it would malfunction/overflow, gas can escape outside via this J-shaped pipe.This view was taken facing east at approximately 1:00 PM on Wednesday, March 29, 2017. Before Brian cleaned this door, it had a distinct green patina. 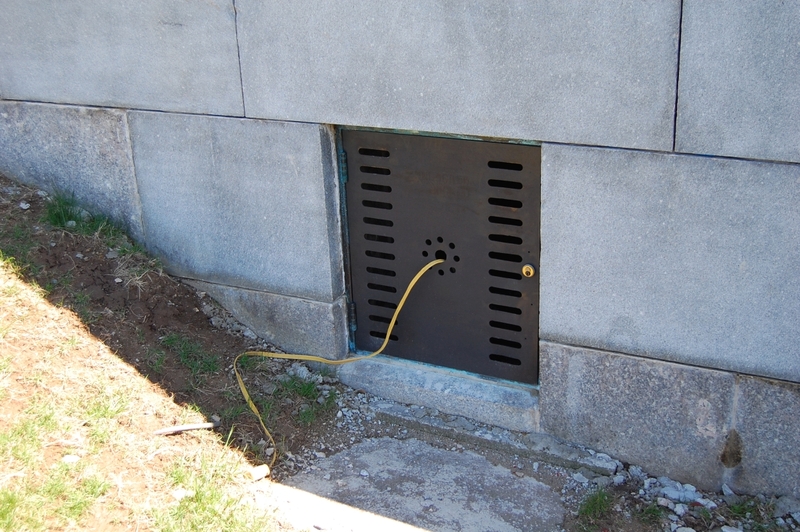 The door allows access to the monument’s electricity, gas, and to the shaft of the memorial.This view was taken facing north at approximately 1:00 PM on Wednesday, March 29, 2017. The northwest side of the Peace Light as it appeared in 2008.This view was taken facing north at approximately 3:00 PM on Thursday, December 25, 2008. Let’s go through that small door…The first thing we noticed was what Gary referred to as a “rust stalactite.” The restoration crew replaced any steel parts they came across with stainless steel ones to prevent future rusting.Apparently there were even more rust stalactites and stalagmites found during the restoration of the Pennsylvania Memorial. This view was taken facing north at approximately 1:00 PM on Wednesday, March 29, 2017. Brian is bending down by the door we just crawled through. 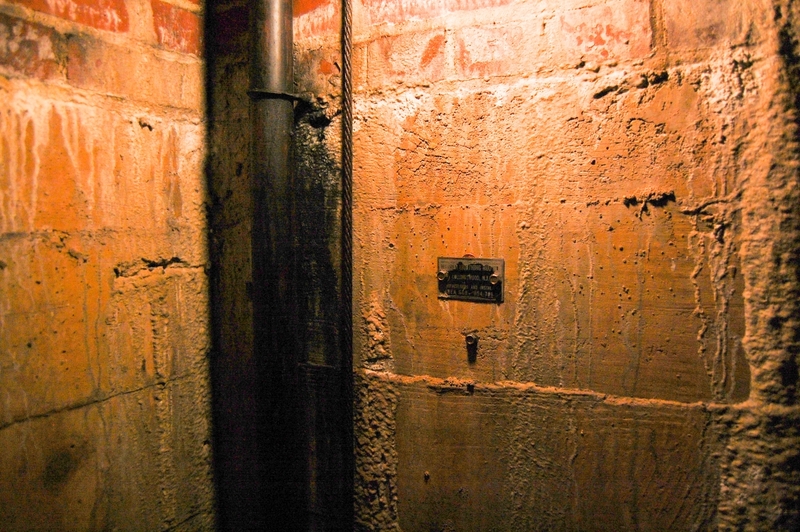 When you come through the door, you can stand comfortably in this small chamber that has gas and electric lines in it.We turned our flash on here. It was dark. This view was taken facing north at approximately 1:00 PM on Wednesday, March 29, 2017. There were a few items in here that even Gary and Brian were unsure about. 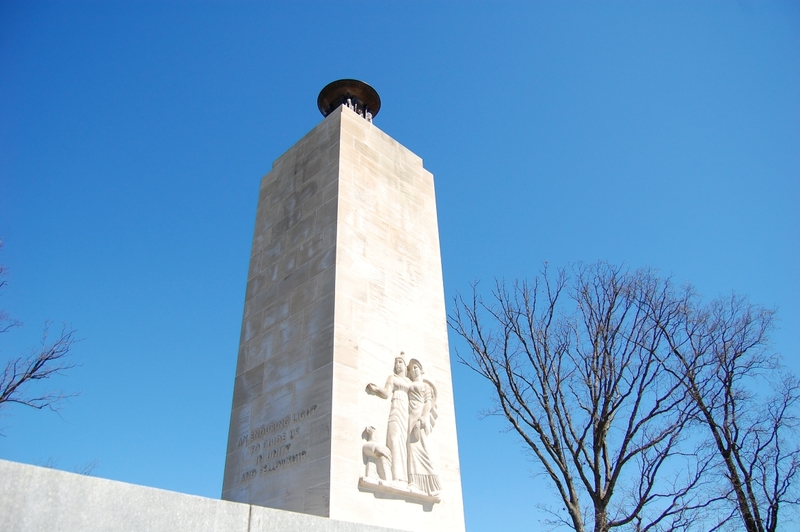 The monument has seen a number of internal changes over the decades due to difficulties with its eternal flame.This view was taken facing east at approximately 1:00 PM on Wednesday, March 29, 2017. 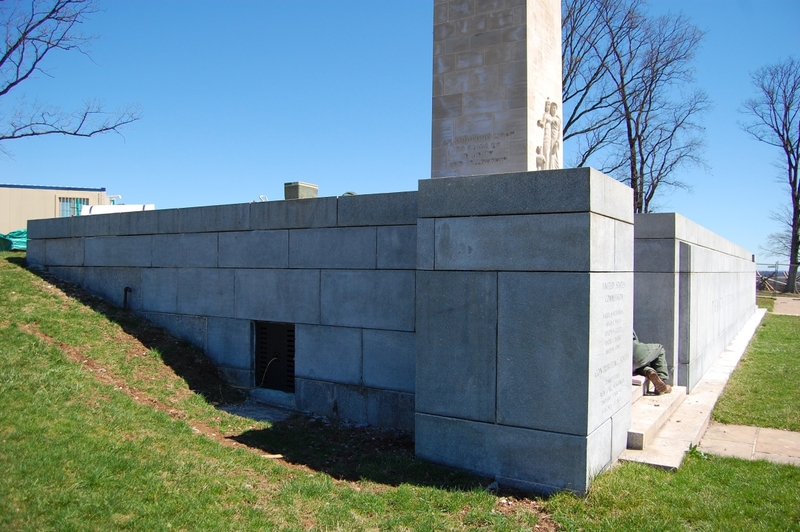 The northwest half of the monument contains a hollow substructure. We had to duck here. See the small opening in the right background? That will put us inside the hollow shaft at the center of the memorial.This view was taken facing east at approximately 1:00 PM on Wednesday, March 29, 2017. Yes, it was pretty dark in here too, but at least we had good company. 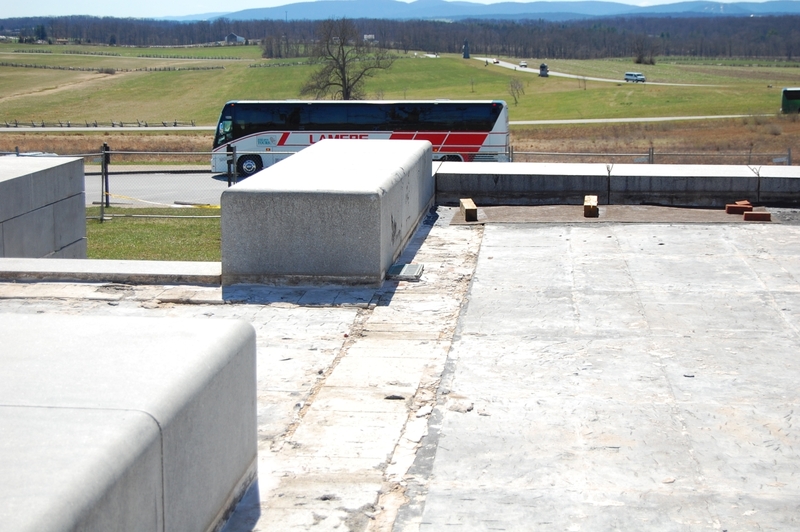 Brian was explaining how brick makes up a large portion of the monument’s substructure.This view was taken facing north at approximately 1:00 PM on Wednesday, March 29, 2017. 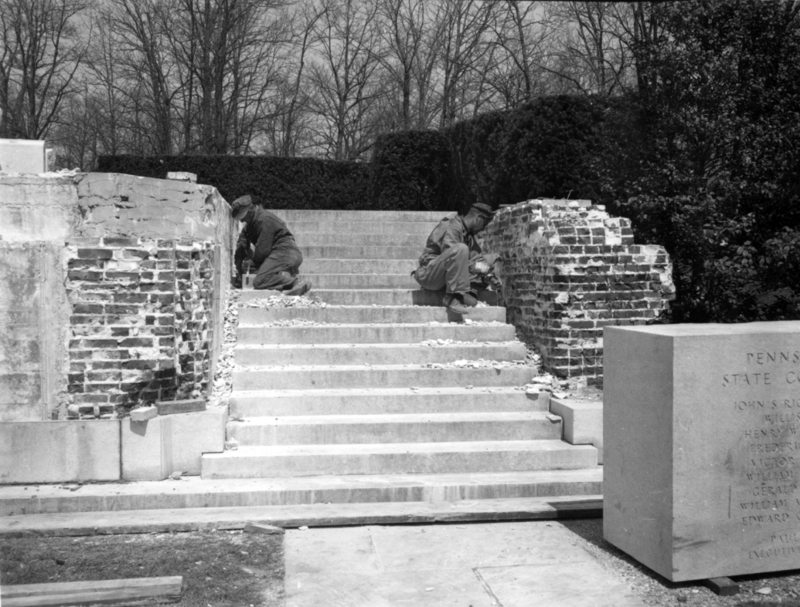 Brick, concrete, and steel compose much of the monument’s interior.This view was taken facing northeast in August of 1943 by National Park Service Ranger Frederick Tilberg. The sign on the wall is for the lightning rod cable.This view was taken facing north at approximately 1:00 PM on Wednesday, March 29, 2017. We’re standing under the eternal flame. 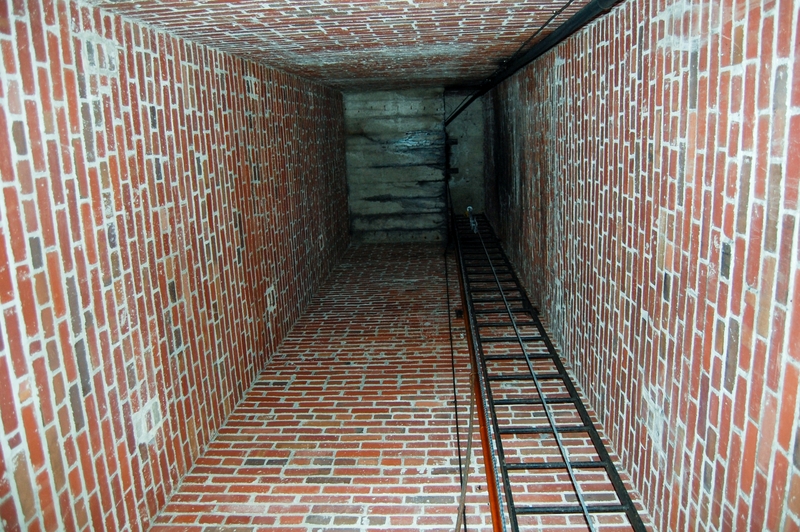 A rusted metal ladder is on the northern interior of the monument’s shaft. The preservation crew determined that climbing the ladder was unsafe, so they are using a line and harness to ascend and to comply with safety regulations. There is a concrete platform at the top of the ladder.This view was taken facing north at approximately 1:00 PM on Wednesday, March 29, 2017. Count about three or four stones down from the top of the monument. That’s where the platform is. 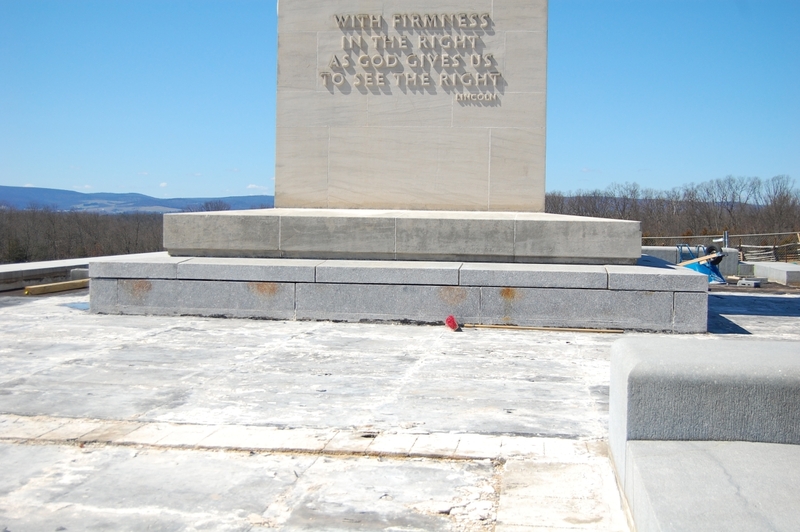 You can then stand on the platform and access the bronze urn and the eternal flame.This view was taken facing northeast at approximately 1:00 PM on Wednesday, March 29, 2017. The monument remains closed to the public while restoration is underway.This view was taken facing northeast at approximately 1:00 PM on Wednesday, March 29, 2017.